Goal #2 of the United Nations’ Sustainable Development Goals (SDGs) aims to end hunger, achieve food security and improved nutrition, and promote sustainable agriculture by 2030. This calls for innovative agricultural solutions worldwide, in order to feed the projected 8.5 billion people for the referred year. Different agricultural development models have been tested and used globally, including the green revolution. However, the current trends tend to encourage farming models that use low chemical inputs, relying on biodiversity and natural products. Throughout history, humankind has largely relied on plants for foods, medicines, and other services. Many of these plants have undergone domestication, while an even larger proportion remained in the wild state and were never cultivated. Humans started to domesticate plants and animals nearly 12,000 years ago (Gepts and Papa 2002). Trends also indicated that 50% of today’s domesticated land plants and animals were so since 4,000–5,000 years before present (Duarte et al. 2007). Overall, greater domestication efforts were made by first humans, most plausibly as a result of the changing environment (Zeder 2015). Besides, it is estimated that out of the 391,000 plant species that have been identified, so far 30,000 of them are edible, and about 5,538 have been cultivated or collected to meet food needs by humans throughout history (FAO 1998; Kew 2016). 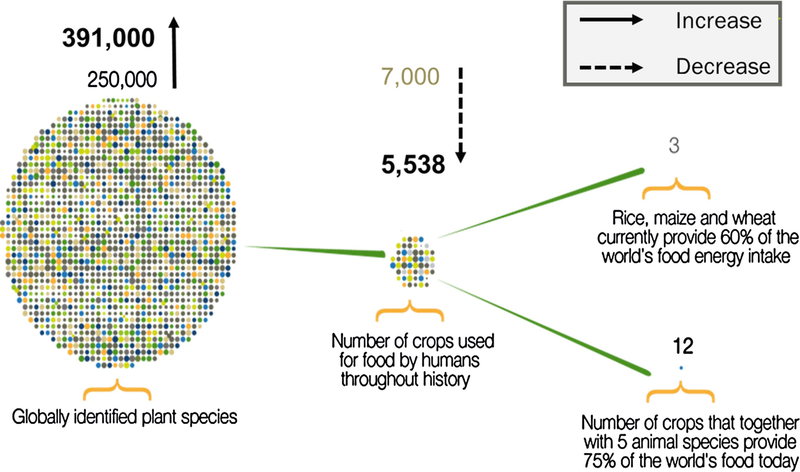 However, only four plant species (rice, wheat, maize, and potato) provide 60% of the world’s food energy supply today. This is a consequence of modern agriculture characterized by uniformity of production, resulting in extensive land conversion and concomitant agricultural biodiversity loss (Sunderland 2011). In fact, the ever-increasing demands for foods and other services, combined with new global challenges (e.g. climate change), have led contemporary civilizations to put more emphasis on developing high-yielding and pest- and disease-resistant varieties, for a very narrow set of selected crops. This option has proven effective in achieving food security in many parts of the world, while its efficiency in reaching adequate nutrition, healthy lives, and sustainable agricultural and food systems is disputed (Khoury et al. 2014). In fact, high-yielding varieties, often hybrids, are high inputs demanding (chemical fertilizers and pesticides) that the smallholder farmers in developing countries can hardly afford. In addition, there are arguments that biodiverse and multifunctional farms and landscapes, especially by including and managing landraces and wild edible plants, enhance resilience of the agroecosystems to extreme weather and reduce risks of crop failure (Antofie and Sava Sand 2018; Jarvis et al. 2012; Sunderland 2011). Indeed, the presence of these crop landraces and wild relatives in the agroecosystems for centuries increased their adaptive capacity, as they have evolved with the changing environment. In this respect, wild food and medicinal species are continuously introduced, evaluated, and maintained in agroecosystems by smallholder farmers. However, national and global agricultural policies promoting new bred varieties and regulating international trade may negatively affect efforts of the smallholders to maintain and increase agricultural biodiversity for sustainable food and nutrition security. The current paper reviews the contributions of plant domestication for improved food security. Scholarly literature on plant domestication, its objectives, principles, and benefits to humans in terms of climate change adaptation and mitigation and strengthened food and nutrition security was reviewed. Data were retrieved with CABI and Google Scholar search engines. Data search terms were domestication, climate change, resilience, and food security. Several authors have attempted to explain the Neolithic Revolution that brought domestication and agriculture. The most plausible explanation is that domestication is a response to the unbalance between supply and demand for foodstuffs (Gepts and Papa 2002). The food shortage in this context can be either due to population increase or to climate change or both. Thus, domestication aimed to supplement this shortage in food by developing new and reliable food sources. By domesticating new crops, human increases the availability of food products and other non-food stuffs they need to maintain their lives. Nowadays, domestication of new crops is more seen as diversification strategy in order to increase the resilience of both food and nutrient security and the agricultural ecosystems. The core principles for successful plant domestication are the intrinsic characteristics of the species that should let them adapt to cultivation environments and management practices, and these traits must be highly heritable. This is known as the domestication syndrome (Gepts and Papa 2002). The more plastic characters are, the more “domesticable” are the species. The highly adaptative plastic types can be easily produced in different environments. The most important of such traits include the ability of seed to quickly loose dormancy, ability to retain seeds upon maturity, increase in seed size, etc. (Jarvis et al. 2016). Other traits concurring to the success of plant domestication are the growth habit (compact), the pollination system (self-pollination), and the amount of toxic compounds (low) in organs. It is admitted that domestication has transformed human societies. The transition from hunting and gathering to agriculture was an important revolution in human’s history. In fact, by developing new crops and producing enough food reserves, it allowed for specialization of groups in society. Food production has led to technology explosion where sedentary living allowed for the accumulation of heavy technology (Diamond 2002). Indeed, domestication continues to affect humankind by providing alternative resources and strengthening resilience of food and agroecosystems. For instance, domestication of indigenous tropical fruit trees (Dacryodes edulis (G.Don) H.J.Lam, Irvingia gabonensis (Aubry-Lecomte ex O’Rorke) Baill., Ziziphus mauritiana Lam., etc.) increased farmers’ income and enhanced agroforests’ functions (Tchoundjeu et al. 2006; Leakey et al. 2003). There is rising voice on the potential of biodiversity in addressing problems of malnutrition (Burlingame and Dernini 2012). Agricultural diversification involves the combination of several crop varieties and/or species in the farm plots. With the increased uncertainty induced by climate change, there is increased recommendation to diversify the farming systems in order to enhance their resilience (Remans et al. 2015; World Economic Forum 2018). Most often, the neglected and underutilized species (NUS) dominate these “diversified fields.” These comprise many stress-tolerant crop landraces or varieties that support harvest security under climate stress and variability. In fact, these NUS crops are usually recently domesticated or still undergoing the domestication process which farmers continue to breed in their farms. They have evolved with the changes of the environment and enable agroecological interactions that mitigate the effect of climate change (e.g., reduced evaporation, enhanced soil fertility, and reduced pest and disease pressure). Such species include fonio (Digitaria exilis (Kippist) Stapf), many of the traditional leafy vegetables (Cleome gynandra L., Crassocephalum spp. ), and indigenous fruit trees (Vitellaria paradoxa C.F.Gaertn., Vitex doniana Sweet). Development of new crops from the currently non-cultivated ones can increase the overall food supply (Rubatzky and Yamaguchi 1997). However, diversification alone does not lead automatically to a reduction in climate vulnerability or improved nutritional status of people. This should be developed around the complementarities of species and landraces/varieties based on current and future climatic and socioeconomic conditions. This should also be informed by the awareness on dietary inadequacies of households’ food patterns and cultural norms and enabling policies and appropriate institutional supports, for instance, in the form of incentives to support farmers’ conservation efforts. The ultimate aim of sustainable agriculture is to develop productive and profitable farming systems that are likely to conserve the natural resource base, protect the environment, and enhance health and safety and to do so over the long term (Parr et al. 1990). The approach focuses on the cultural and management practices. According to Pretty (2008), the concept of sustainability encompasses both those of resilience (the capacity of systems to withstand shocks and stresses) and persistence (the capacity of systems to continue over long periods). In the face of the challenge of feeding nearly nine billion people by 2050, recent development indicated agroecology-based farming system as the unique system that can boost food production and improve the situation of the poorest (Altieri et al. 2012). Agroecology-based production systems are intrinsically biodiverse, resilient, energetically efficient, and socially just and comprise the basis of an energy, productive, and food sovereignty strategy. It has been reported that farmers employing this production system have developed good coping and anticipative strategies toward climate change. The agroecologically sound production system is based on a number of principles including (i) the integration of biological and ecological processes into food production, (ii) the avoidance of the use of environmentally harmful inputs, (iii) the efficient use of the knowledge and skills of farmers, and (iv) the productive use of people’s collective capacities to work together to solve common agricultural and natural resource problems, such as pest, watershed, irrigation, forest, and credit management. In this system, the importance of agroforestry and tree-based system for the sustainability has been largely recognized (Scherr and McNeely 2008). Tree species undergoing the domestication process, from the simple on-farm conservation to the proper cultivation, hold the potential to diversify the agricultural system and thus to increase the farming system resilience. For instance, in countries such as Malawi, Tanzania, Mozambique, Zambia, and Cameroon, the association of on-farm conserved fast-growing and nitrogen-fixing shrubs (e.g., Calliandra spp. and Tephrosia spp.) with maize enhanced maize production by 62.5% compared to a maize mono-cropping system. Similarly, in Malawi, maize yields were increased by up to threefold in the zone under the tree canopy compared with the zone outside the tree canopy (Altieri et al. 2012). Apart from their direct contribution to production, tree species under domestication also contribute to nutrient recycling through dead leaves that participate to enrich the soil. The re-greening of Maradi and Zinder regions of Niger through the establishment of woodland trees over five million hectares represented another important example of the contribution of species domestication (through farmer-assisted natural regeneration) to the agricultural system’s resilience (Sendzimir et al. 2011). Conservation of plant genetic resources through in situ conservation of the species in their native habitat, circa situm conservation through species management in agroforestry and cultivated systems, and ex situ management through conservation in gene banks and field banks are fully part of biodiversity conservation (Dawson et al. 2013). These three approaches require optimization for biodiversity sustainability. In parallel, domestication is a long-standing process starting by the simple gathering followed by incipient domestication (under all its forms) strategies and ending by a clear breeding of utmost interesting traits. Domestication ultimately resulted in the mastering of species attributes. Each of the above-detailed domestication processes contributes to some extent to optimize and/or increase the conservation of biodiversity. In the earlier gathering stage of the domestication, diverse resources (mainly seeds from fruit or flower) are collected from different places and shifted to new ones and then contribute to an unplanned enrichment of the local biodiversity. In the following stage of incipient domestication, its contribution to biodiversity increase is higher. Incipient domestication is expressed as the on-farm maintenance and management of species either in home gardens or in agroforestry systems and is widely applied by local communities (Msuya et al. 2008). Home gardens are considered as the first place of domestication experimentation by local populations (Watson 2002), where planting materials especially seeds and cuttings are gathered and planted or introduced with the expectation to help diversify household food diets (Gautam et al. 2009). Home gardens often encompass a high number of species, from various genera to families. In Nepal, for instance, a study across 4 localities of Hill and Terai Plain (Gulmi, Ilam, Jhapa, and Rupandehi) revealed a total number of 342 species recorded in home gardens (Gautam et al. 2009). In Benin, roughly 300 species belonging to 200 families were recorded in home gardens, out of which 20 were wild crop relatives (Salako et al. 2014). More importantly, there was a very low similarity among the species diversity in those home gardens, across the major phytogeographical areas of the country. What was initially considered as planting attempts quickly became a center of huge mini-biodiversity favored by natural mating among crops and artificial selection. Incipient domestication through home gardens largely contributed to biodiversity creation and increase. By so doing domestication offered the possibility to populations to extract a large part of their needs (e.g., foodstuffs) from these home gardens, rather than exerting pressure on protected areas designed to favor in situ conservation. On other hand, the on-farm conservation of tree species expands the magnitude of the exploitation of useful species by populations without relying on species under in situ conservation. This then helps maintain the evolutionary trend in these latter species, thus allowing new variation to be generated in the gene pool that will allow the species to adapt to changing environmental conditions. Incipient domestication also helps take plant species out of pressure or extinction. For instance, out of the 300 species recorded in home gardens in Benin, 12 species were classified as threatened. In the same vein, Vodouhè and Dansi (2012) indicated that the species Caesalpinia bonduc (L.) Roxb. (a red-listed species in Benin) would have completely disappeared in that country if it has not been incipiently domesticated and maintained in their home gardens by local communities. Another strong illustration of the contribution of domestication to biodiversity creation was exemplified by Salick (1992). The author indicated that for the species Solanum sessiliflorum Dunal, the Yanesha indigenous people of central Peru took advantage of maternal inheritance and used successive selection schemes to create 35 new fruit types (combining shape and size). Likewise, from 1986 to 1999, there has been a 90% turnover in the diversity of Manihot esculenta Crantz cultivars used by the same Yanesha people (Salick et al. 2000). When it comes to active and advanced domestication stages, development of cost-effective propagation techniques, a better understanding of the seed physiology, the reproductive biology, and development of production packages will help maintain and increase diversity. Understanding seed physiology and development of appropriate propagation technics help identify the best ex situ conservation approaches (living collections, botanical gardens, tissue culture, and gene bank storage) and maintain existing diversity. As far as a clear knowledge on the reproductive biology and of the genetic variation are concerned, they would help increase biodiversity through crossing and mutation induction, while development of appropriate agronomic techniques is of foreground importance in sustaining the biodiversity created. Food and nutrition security exists when all people at all times have physical, social, and economic access to food, which is safe and consumed in sufficient quantity and quality to meet their dietary needs and food preferences, and is supported by an environment of adequate sanitation, health services, and care, allowing for a healthy and active life. The concept of food and nutrition security was one of the hottest topics in the research and development initiatives during this last decade. It encompasses the main dimensions of availability, accessibility, utilization, and stability and was discussed at four main levels: global, national/regional, household, and individual level (Sassi 2018; Biesalski et al. 2017). In this section, the interplay between plant species domestication and the food and nutrition security at the household and individual level was analyzed. Although there is still debate around unifying the definition of the “crop domestication” concept (Rindos 1984), due to conflicting approaches used, there was however agreements that domestication ultimately ends up in a certain phenotypic differentiation in the domesticates compared to wild forms. There is also an increase in the frequency of favorable allele underpinning traits of interest through successive selection pressure imposed by domesticators herewith referred as human. Worldwide, smallholder farmers often viewed as resources-limited people relied to a large extent on the intensive, but rationale use of wild diversity for various purposes. In Europe, roughly 600 edible plant species were wild-collected for consumption (Schulp et al. 2014). On the same continent, the benefit generated from wild berry and fruit collection in 12 countries in 2005 amounted €42 million (MCPFE et al. 2007). Similarly, a study conducted on 7 Mediterranean species indicated that more than 400 wild plants species are gathered and consumed (Hadjichambis et al. 2008). In Africa, a total of 165 wild edible plant species were reported consumed by local population of Turumbu, Mbole, and Bali in the district of Tshopo in Congo (Termote et al. 2011), whereas in Ethiopia 56 wild fruit species were reported to be collected for consumption and/or for sale by the local population of 3 districts in the Amhara region (Fentahun and Hager 2009). Moreover, these wild resources are reported to be highly nutrient-rich and then hold the potential to correct the nutrient deficienc in local population and reduced cost associated with a balanced diet (Termote et al. 2014). There is evidence from Mali that the smallholders with higher natural capital (improved crop varieties, landraces, and wild managed species) were more food secure (N’Danikou et al. 2017). More importantly, wild plant resources are reservoir for useful genes for cisgenesis and transgenesis, especially to cope with climate change adverse effects. However, a frail aspect in these wild resources exploitation is the random pattern in their availability and their low production that hampere their potential to sustainably contribute to food and nutrition security. For a long time, three major cereals (rice, wheat, and maize) have constituted the basis of the world’s food security. These cereals have led the green revolution and this is a result of domestication. For instance, wheat and rice that hold an important role in the green revolution and that still remain major food resources for smallholders saw their productivity drastically increased through genetic introgression of the dwarfing genes (e.g., Rht-B1b and Rht-D1b for wheat and Sd1 for rice) (Hedden 2003). However, with the rapidly growing world population coupled with the adverse effect of climate change, the ability of these few cereals to meet future quantitative and qualitative food demand is threatened. Indeed, predictions indicated that the world food need will increase in average by 85% by the next 30 years, while production of these cereals is stagnating with low progress at certain places and qualified unsustainable for other places (Wei et al. 2017). In addition, the importance of food nutrient density for the food and nutrition security has been raised (Troesch et al. 2017). All these call for the necessity to look or to work for increased food availability and for alternative and augmented food nutrient sources. In this vein, wild resources represent a naturally available options which potential is to be unlocked by introducing them into an active domestication process. Domesticating wild plant species will increase the diversity of food sources, increase their productivity, enabling a better valorization of their nutritional potential, and enhance their contribution to smallholders’ income. As illustration, strawberry is a recent domesticated crop, and its production has expanded, while its nutritional potential is better exploited to meet human needs (Diamond 2002). Although domestication holds the potential to improve food security worldwide and to increase resilience of the farming systems, its realization is challenged by several issues, including among others the national and international agricultural policies. The general tendency of world’s agricultural policies is the homogenization of production systems, with increased subsidies for hybrid crops and monoculture. This undertaking jeopardizes domestication efforts in general and the displacement of local cultivars by improved, high-yielding crop species. By doing so, the different policies of modern agriculture have promoted intensification at the expense of systems diversification. Several initiatives have been led by indigenous farmers to cultivate a range of wild food plants. However, very few of these have led to full domestication because of the pull by national policies toward monoculture. For instance, several farmer-developed crops – also termed local cultivars or landraces – have been neglected by scientific research which should take them to the stage of modern crops. As shown by Duarte et al. (2007), 90% of today’s crops were domesticated more than 2,000 years ago. In the same line, global data indicated that while our knowledge of the world’s plant diversity continues to improve, the diversity of food plants is drastically shrinking (Fig. 1) (FAO 1998; Kew 2016). The data released by the Food and Agriculture Organization of the United Nations about 10 years ago indicated about 30,000 edible plant species, of which 7,000 have been used for food in human’s history (FAO 1998). Recent updates indicate only 5,538 food plants (Kew 2016). This decline is the consequence of genetic erosion of the diversity of food plants, as a result of our agricultural models. Despite the increased awareness on the importance of these neglected and underutilized species for food and nutrition security, they have not yet received the deserved attention. There is lack of characterization, breeding, and evaluation information on the species for their improvement (Padulosi et al. 2013). Economic reward is one of the most important incentives for a successful domestication. While very few species have attracted niche markets, several others have low commercial values. Therefore, they are not competitive with other crops, and thus farmers lacked incentives to continue to maintain and breed for new domesticates (Padulosi et al. 2013). This has led to changes in land use with the replacement of species ongoing domestication by commercial crops. Urbanization, migration, and the lack of adequate awareness on the nutritional values of the species also have a bearing into the slow domestication pace. These contribute to the loss of indigenous knowledge on the species and changes in local diets, as there is increase in the perception of low status of some of these species not widely cultivated. Nonetheless, there are cases where adequate institutional support and promotion have led to increased interest by the populace and great contribution to local economies and to food and nutrition security. This is the case for African eggplants (Solanum spp. ), fonio (Digitaria exilis), and Moringa (Moringa oleifera Lam. ), though there is still the need to organize the seed supply systems and improve agronomic practices. Other species such as Ceratotheca sesamoides Endl., Cleome gynandra, and Vitellaria paradoxa still require important investments and support. Accelerating plant domestication is not an option but a priority for ensuring a sustainable food and nutrition security. To achieve this, the following actions identified by Padulosi et al. (2013) for NUS also apply to indigenous species under domestication. There is need to change the imbalance between agricultural policies and practices, currently skewed toward selected few commodity crops. In this line, it is important to support indigenous farmers to conserve and use local agricultural biodiversity. Scientists and decision-makers need to be aware of the economic, nutritional, and cultural values of these species and for the resilience of present and future agricultural systems. Scientists especially the young generation need to develop their skills and capacities to support the work by custodian farmers. Policy and decision-makers need to understand the role and benefits of plant domestication. This will ease the institutional support and investments into research and development plans and programs to promote the development of new crops. Several underutilized species such as fonio need breeders and other specialists to improve the crops and agronomic practices. Capacity development also calls for enhanced skills and capacities across the value chains and investing in infrastructure and institutions (research, education, development, markets, farming communities, etc.). Strengthening global collaboration is vital to advance the agenda on new crop development and agricultural diversification. Through scientific and technological collaboration, skills will be developed on advanced molecular techniques (e.g., genomics) to speed up the discovery of traits associated with domestication, also known as “domestication syndrome” (Jarvis et al. 2016). For example, molecular characterization, particularly the quantitative trait loci (QTLs), is being used as a major technique for understanding the genetic basis of plant domestication. QTLs are multiple genes that affect a particular phenotypic feature. The genome editing technology was also reported to complement and enhance breeding and selection strategy (Francis et al. 2017). This was used on wild tomato (Solanum pimpinellifolium L.) to develop progenies resistant to salt and to the bacterial spot disease (Li et al. 2018). However, very few research institutions are so far involved in sequencing the genome of the neglected and underutilized species, and this needs to change. Feeding a forecasted nine billion people in a context of changing climate will require innovative solutions in the agricultural sector, especially in smallholder farming communities. It is discussed in this entry the importance of domestication as a farmer-led innovation to increase agricultural biodiversity and resilience of agroecosystems in general. In addition, development and introduction of new crops from existing local biodiversity increase food availability and help maintain local food cultures. Many indigenous species have been developed into new crops in the tropics and have tangible contribution to meet food and nutritional requirements in smallholders’ households. An important number of these new crops have attracted niche markets and have a substantial impact on household revenue. It is also demonstrated that domestication enhances biodiversity conservation, especially for threatened species. Overall, domestication could be the innovative solution of the millennium to increase and sustain ecosystem services and promote sustainable agriculture. However, access to these benefits will require important interventions in order to address the key challenges that were identified, importantly the need to develop research capacities and global collaboration on new crop development suitable to the changing environment. Lastly, it is worth mentioning some limits of this paper, and an important one is that the examples given in the current review are limited to plant domestication. Although the development of new animal breeds can increase productivity and food security, one can hardly find examples where animal domestication is used as a strategy to increase resilience of agroecosystems and nutrition security.